Set in the year 2048, the concepts of humanity and robotics are still conflicting. There are those who accept advancements such as robotic workers, cybernetic implants, and the like, while others see them as invasive, threatening, and unnatural. This conflict has led to a fanatical group blowing up part of a tech corporation’s lab and destroying a lot of equipment. Unfortunately, this incident has caused far-reaching problems, and characters such as Frank and Joe get pulled into the aftermath. The preview began with Frank, a private investigator, getting a call from an associate named Sibyl. She informs him about the aforementioned attack and that one of their mutual friends Lamar has been arrested in relation to it. Based on Lamar’s history, it seems as if he’s been set up; he may have disliked cops, but he isn’t a killer. You are then tasked with sneaking into buildings in order to discover the truth behind the situation. Later on, I was thrown into the shoes of Joe, a boxer who has some cybernetic implants. His daughter died as a result of the aforementioned attack and he will stop at nothing to deal with who was responsible. In order to play successfully, stealth is the name of the game. You can either jog or press shift in order to walk. 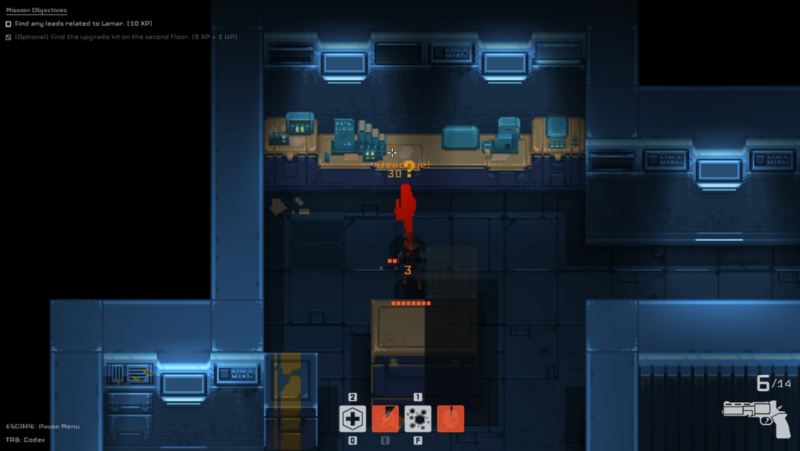 Walking is quieter and allows you to see the vision cones of enemies. If you stay within an enemy’s sight for too long, they’ll attack you and alert nearby enemies. 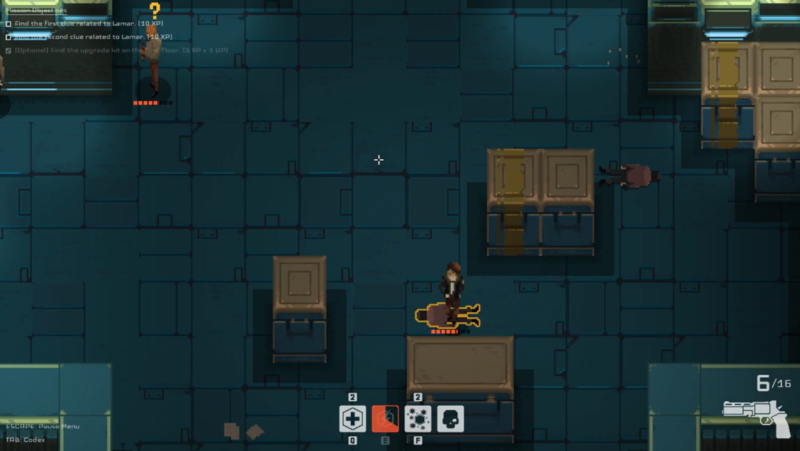 You can win these fights, but it makes progression harder, especially if they have guns; odds are you’ll take a good chunk of damage before you’re done. The best way to handle enemies is by sneaking behind them and melee attacking them with a sneak attack. If there are patrolling enemies nearby, you may want to quickly drag the body out of sight. This feature is incredibly helpful because if a body is spotted, the enemies will be more alert. If things get out of hand, you also have a gun to use, but with the downside that it’s noisy. Also, if you kill people during your missions, you’ll be scolded about it by other characters in-between missions. Not sure if there are any other lasting effects throughout the story; there’s a chance it could affect the outcome of the story, but that’s just a guess. Each character has their own set of abilities that are incredibly helpful. Frank has med-kits, a taser, and smoke grenades, while Joe has adrenaline, a charge attack, and flash grenades. The taser and charge attacks are moves designed to stun who they hit, which became my most used abilities. They have unlimited uses, but they also have cooldowns. On the other hand, the other abilities mentioned have finite uses, so you need to use them more carefully. I found a use for every ability; some are better suited for different situations than others. If you find upgrade kits in the levels, you can use them to upgrade your abilities in-between levels. As you play, you’ll encounter some cybernetic squares called uplinks that serve as checkpoints. If you stand on one, it saves your progress, but each one can only be used once. It’s a bummer that they only have one use, but the fact that you can decide when to activate them is a plus. The gameplay itself can be tense, but that’s most of the fun. Sneaking around and timing your attacks successfully is incredibly rewarding. On the flipside, when you get caught and annihilated by groups of enemies, it hurts. If you haven’t hit a checkpoint lately, it’s very disheartening. That being said, you have to keep calm or else you’ll rush in and die repeatedly. Even with the multiple deaths that I experienced, I couldn’t help but want to continue. My desire to learn about each story and hopefully resolve them kept me playing. Unfortunately it was only a preview build, but it made me excited to see what’s to come in the full release. As of now, the release date is slated for sometime this year, so hopefully it comes sooner rather than later.